Tim Gardner Is (Finally) A Buckeye!! Great news for a Saturday; it’s great to come back from a vacation to read that Indianapolis Lawrence Central’s Tim Gardner has become the 16th member of the Ohio State 2013 recruiting class. Gardner initially “verballed” back in June, but was informed that his commitment wasn’t quite necessary at this time- there’s speculation that the Buckeyes wanted to see his discipline in the form of some conditioning. He did the work, and was seen as a part of Friday Night Lights working with Buckeye great and offensive guru LeCharles Bentley… you can check his form in the photo to the right, from our friend Josh Winslow. The off field dedication, the passion and potential that LeCharles saw in him all led to the staff welcoming him as a part of this incoming class. At 6′ 5″ and 300+ pounds, he’s projected as a guard at Ohio State, although he currently plays tackle at Lawrence North, an Indianapolis powerhouse. You can get a glimpse of his work in this Hudl.com highlight video- pay attention to his feet and agility, as well as his propensity for finishing blocks. Gardner is currently rated a “three star” by some recruiting services, although there’s a lot of speculation that this will change as Tim continues to work through his senior season. 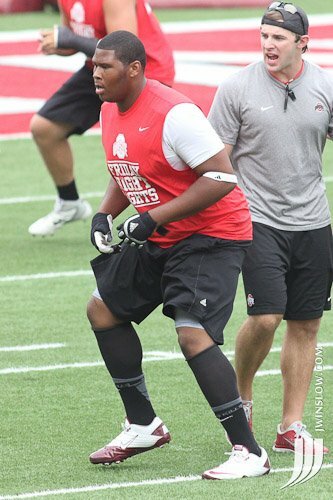 He held offers from Notre Dame, Indiana, Purdue, and Louisville as well as Ohio State. With Gardner in the fold, there’s speculation that Ohio State may only take one more offensive lineman in the upcoming class. If that person is willing to work as hard as Tim did to earn his place in the scarlet and gray, it’ll be an elite group coming in. Welcome to the Buckeye Family, Mr, Gardner!